Thanks to its accessible design, it’s not hard to enjoy Might & Magic: Elemental Guardians. 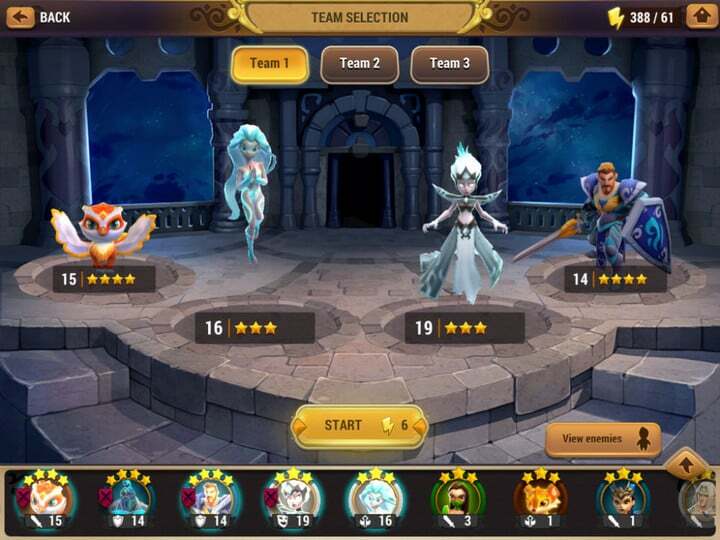 Whether or not you’ve played a strategy-RPG on mobile before, Ubisoft has made it easy to hit the ground running. Even so, there are plenty of ways to mess up, typically by investing too much of your time and energy — and perhaps even your money — on pointless pursuits and strategic cul-de-sacs. The good news for you is that we’ve explored every dead end and made every possible grievous error in the name of scientific research (and definitely not because we’re rubbish). Here are 15 pitfalls to avoid if you want to get the most out of your time with Elemental Guardians. Every creature in Elemental Guardians, even a lowly 1-star dweeb, has the potential to become a 5-star character. It’s heartwarming really. Less heartwarming is the fact that you really shouldn’t waste your time on creatures with fewer than two stars. Potential notwithstanding, they just aren’t worth the effort, Magical Books, and other resources. It’s not their fault. They’re cursed from birth with an inability to evolve, and it’s only through evolution that creatures reach their full potential. Unfortunately for 1-star creatures, their greatest potential is as food for other, better creatures. You might think that 2-star creatures are almost as bad as 1-star creatures since 2 is next to 1 on the sliding scale of uselessness. But they differ in one crucial respect. 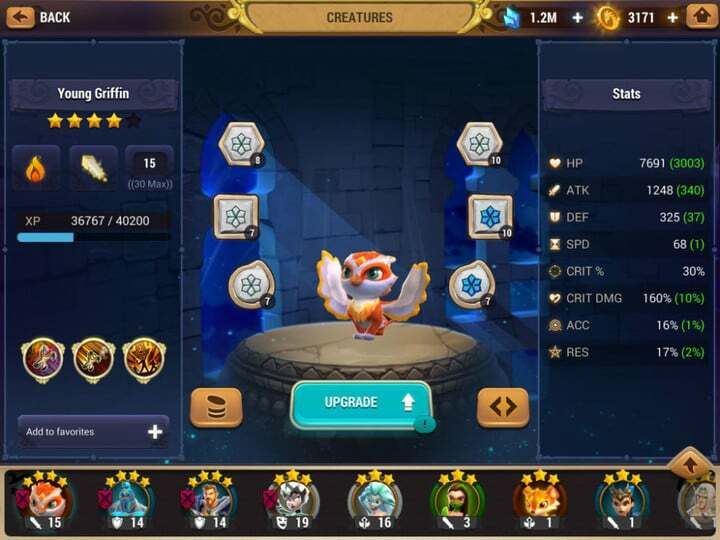 Yes, you guessed it: 2-star creatures can evolve. In fact, they can evolve into some of the best creatures in the game. Consult our Tier List whenever you pick up a new creature to see whether it has the potential to evolve into a battling superstar. Naturally it’s tempting to spend your time in Elementary Guardians battling across the modes, but you shouldn’t neglect the game’s small but vital bits of housekeeping. Specifically, don’t neglect to claim the free resources that regularly become available. 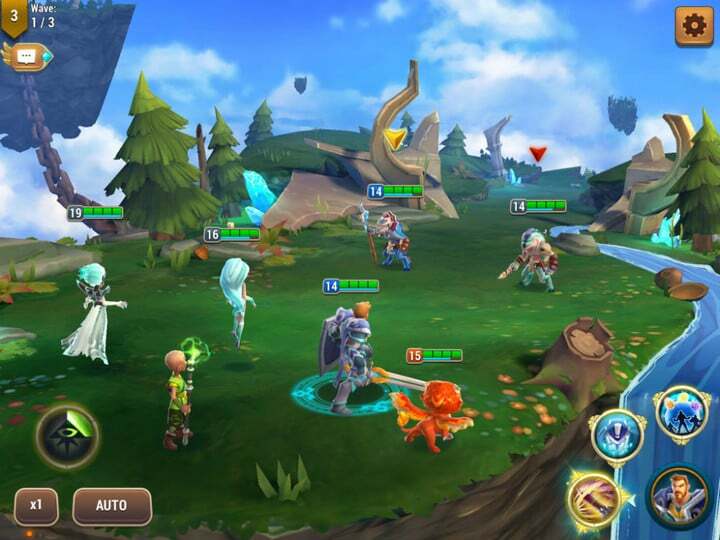 Two of the floating islands on the game’s main screen — Dragon Utopia and Crystal Mine — are dedicated to pumping out free crystals and Seals. Whenever you log in, look out for the notifications over these islands, and tap on them whenever they appear. These resources recharge every 6-12 hours. The beauty of mobile games is that you can play them anywhere, at any time. Even so, there are bound to be days when you simply can’t fit in a session of Elemental Guardians. On such days, it’s a good idea to at least login. 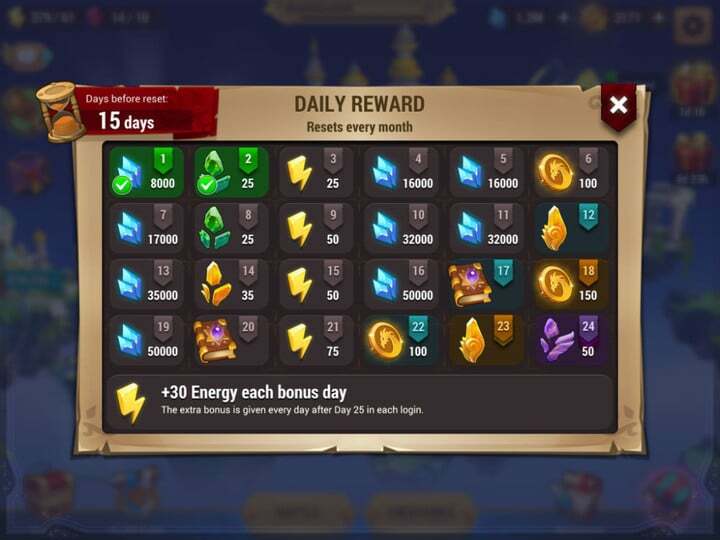 Even if you’re not going to claim any free resources or fight any battles, logging in will advance the daily reward calendar by another day. The reason this matters is that the rewards get better as you get deeper into the calendar. For example, if you keep logging in you’ll eventually get stuff like Magical Books and Legendary Soulstones, both of which are pretty difficult to obtain through normal play. You’d be a fool not to grab them for the minimal cost of a daily screen-tap. In Elemental Guardians, as in life, you’re going to develop favorites. The creatures that work for you initially are the ones you’ll level-up, evolve, and fashion into mains. But you should avoid getting too attached. The fact is, there are too many combinations of roles, strengths, and elemental affinities in battle for you to be able to rely on a small number of amped-up creatures. You need several powerful creatures across the spectrum, and the only way to get them is to field them in battle, even if that means leaving your star player on the bench. You get a finite number of attacks in every Elemental Guardians battle, and you need to make sure each one counts. Thankfully, the game helps you to do this using a handy traffic light system. A green arrow above your target’s head indicates that this enemy’s elemental affinity is particularly susceptible to yours. A yellow arrow indicates that your elemental affinity will have a neutral effect, and a red arrow indicates that your attack will be rendered toothless by your opponent’s elemental affinity. You should never attack a red arrow enemy unless there’s absolutely no alternative. While you’re always aiming to get your creatures up to five stars, you shouldn’t pursue stars at the expense of levels. Climbing the ranks is important, but in a square go level is more important than rank every time. This becomes abundantly clear when you step into the Arena with another player whose creatures have lower ranks but higher levels than yours. It makes sense if you think about it — stars or no stars, a skinny Major will always lose to a beefy Private in a boxing match. We can’t tell you which glyphs to use since they come in so many varieties and have so many different applications. But we give a crucial piece of advice: never mix your glyphs. Each creature can slot six glyphs at a time. While it might make intuitive sense to have each category represented across these slots, just as you want each elemental affinity and class to be represented in battle, this is actually a terrible idea. Why? Because you get bonuses for equipping multiple glyphs of the same type. For instance, if your slots are filled with Vitality glyphs, that creature will get a 40 percent HP bonus — which is massive. You’ll switch glyphs in and out as your collection grows, but as long as you remember the golden rule you’ll always get the best out of them. It’s easy to overlook glyphs among all the different ways you can upgrade and enhance your creatures. It pays to be on top of them, though, since the consensus among experienced players is that they play a vital role in realizing a creature’s full potential. As soon as you amass 130 Seals you can go to the Summoning Altar and spring for an Epic Soulstone, and you can open a Soulstone the moment you get it. It’s tempting to do just that, but you should practice patience. 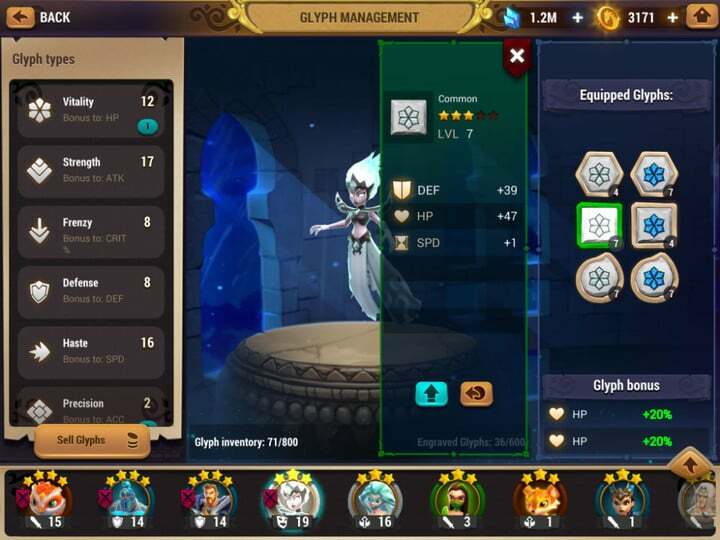 From time to time you’ll come across events in Elemental Guardians that require you to open Soulstones and spend resources — such as Seals or crystals — in prescribed amounts. The last thing you want is to find yourself locked out of an event because you splurged all your resources. Be an ant, not a grasshopper. One pleasant perk of leveling up is that you get a free energy refill. This means you’d be a fool to level up without emptying your tank first. 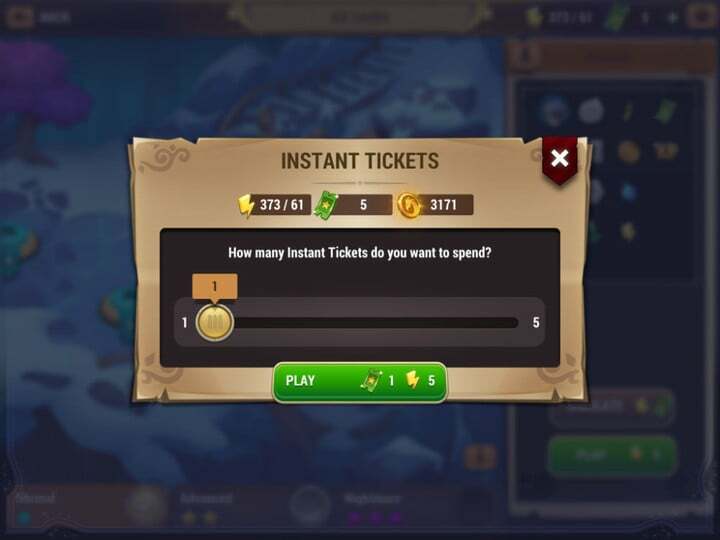 The best way to productively offload energy is to use Instant Tickets to simulate a few battles. This will use up the same amount of energy as playing the battles manually would have, but much faster, and you’ll get a few rewards into the bargain. It’s a no-brainer. As far as using abilities is concerned, timing is everything. That’s because each ability has a cooldown timer, meaning every time you use one you have to wait for a while before using it again. It follows that you should never use an ability immediately before facing a tough enemy. In most cases, that means the final wave of enemies in a given stage. This is where you’ll encounter bosses, and cranked up monsters that are more powerful than their mid-level counterparts. Don’t face them without plenty of ammo, in the form of unspent abilities. To be clear, when we say farming we’re not talking about agriculture. We mean farming in the RPG sense: i.e., returning to completed areas to scour them for extra rewards. You can use Instant Tickets to clear these stages instantly at normal difficulty level, but there’s also the option of replaying them at advanced and nightmare difficulty levels. You’ll have to wait until you’re powerful enough to do this, but once you are you can earn even better rewards. This entry is the last one on our list because it’s the one you should take away from it above all others. Creatures in Elemental Guardians only achieve their full potential through evolution, so you should work on evolving them from the get-go. 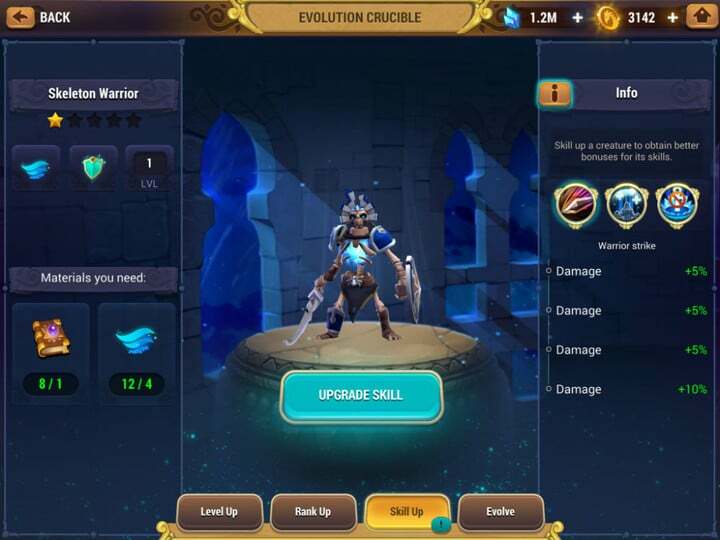 Evolution requires Magical Books, which you obtain with reputation points earned through battling in the Arena. You’ll also need to make regular trips to the Dragonmist Islands to farm the items needed to evolve your creatures. This is the surest way to build the best possible teams.